Some of the background to Edwin’s life and work has already been published, for example in Edwin Smith: Photographs 1935-1971 (1984) and Evocations of Place (2007), but this provides only a partial view. Not only is the focus on photography, much of what has been written is filtered through the protective perspective of Edwin’s widow, the redoubtable Olive Cook. So, in building up the pages on this site we have sought to go outside published sources and add in the fruits of primary research. One of the key sources we are researching is an archive of the Olive Cook Papers at Newnham College, Cambridge. This collection consists of the personal and business papers of Olive Cook and Edwin Smith. They were donated to Newnham College, where Olive was a student, by the executors of her estate in 2003. They range from the 1930s up to her death in 2002, although most cover the last third of the 20th century. 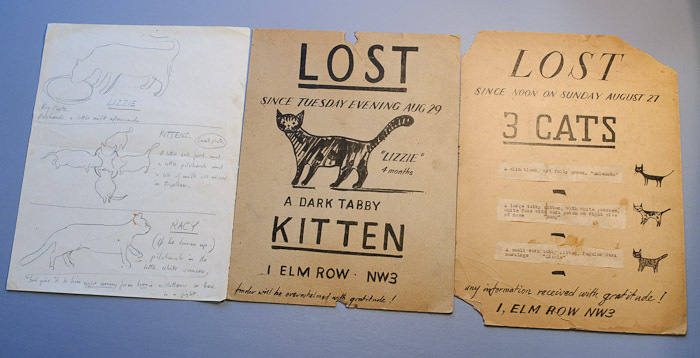 Posters for lost cats, produced by Olive and Edwin. The material relating to Olive includes: personal letters and postcards; short stories and articles; greetings cards both from Edwin and their many friends in the artistic community (all handmade); and research notebooks and drafts of texts for books she wrote herself and those she collaborated on with Edwin. There is also a mass of business correspondence, especially after Smith’s death when she handled all the requests for copies of his photographs. 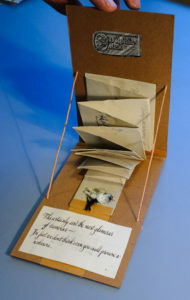 It includes sketchbooks, drawings and photographs and samples of the materials and ephemera they both collected. 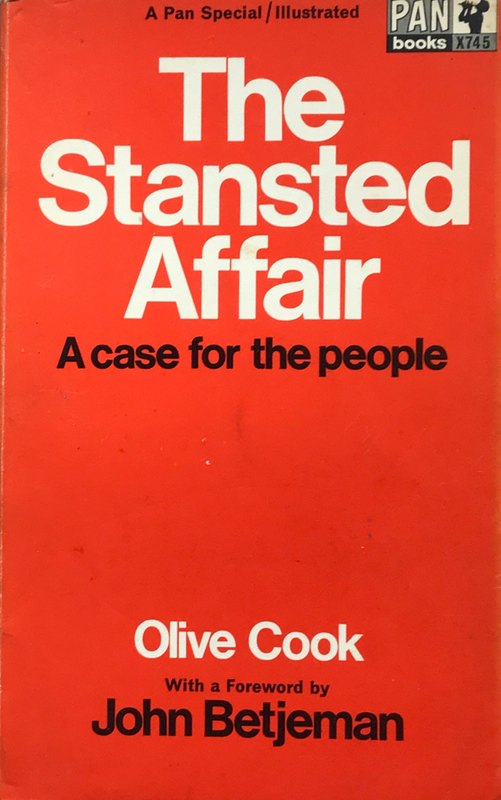 There are also documents about the Fry Art Gallery in Saffron Walden, which Olive Cook helped establish, and where her paintings were frequently exhibited, plus material on and reviews of exhibitions. The archive includes papers on the environmental causes that she championed, such as the fight against the development of Stansted Airport. Olive inherited Edwin’s estate on his death. Towards the end of her life she deposited his huge photographic collection of some 60,000 negatives at the Royal Institute of British Architects (RIBA) along with their letters to each other. The remainder of his papers became part of her archive at Newnham. There are just a few personal letters from friends and those from him to Olive on trips to Europe and Scandinavia, but the business correspondence with his publishers is extensive and tracks the development of the production of his work. There are also notebooks, some with autobiographical material. 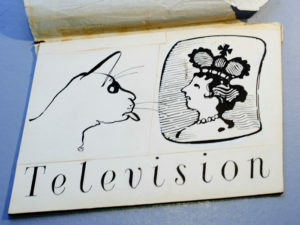 Comic drawing by Edwin Smith, expressing his views on both television and royalty perhaps? 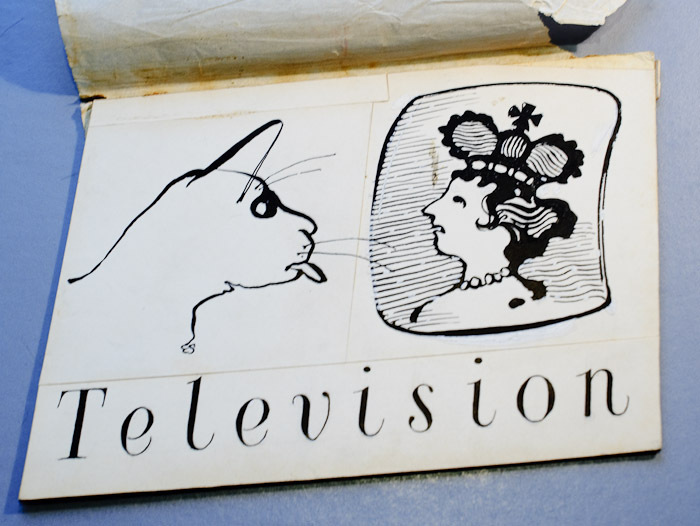 There are many examples of his art: sketchbooks from the 1939 through to the 1960s; a box of loose drawings/paintings, cut-outs/cards; research on clowns, circuses and fairgrounds that includes programmes from the 1930s; exhibition materials; and reviews and clippings. The archive includes examples of Smith’s professional photographs of people, buildings, and landscapes, as well as personal shots of himself and Olive. 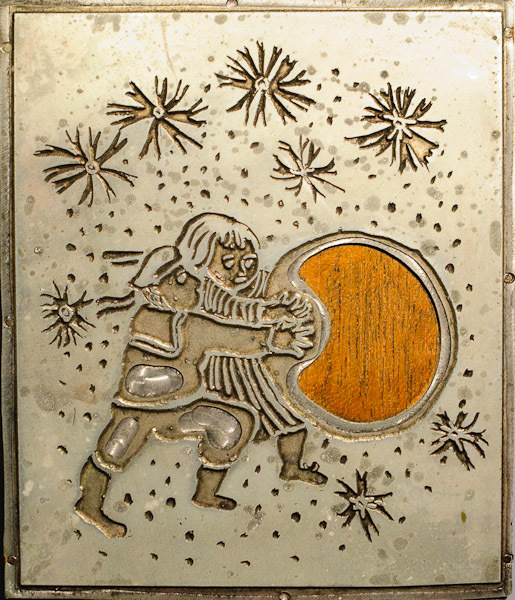 Finally there is a group of papers devoted to artist friends of Cook and Smith such as Peggy Angus, Edward Bawden, Oskar Kokoshka, and Zdzislaw Ruszkowski. These are the bare bones of the archive and maybe that is what the word ‘archive’ leads us to expect, an austere collection of papers gathering metaphorical (though certainly not actual) dust. The reality of working with the archive could not be more different. Newnham College sits quietly on Sidgwick Avenue in the rus in urbe of West Cambridge, a setting that Edwin and Olive would surely have loved. Entering through the gatehouse, a pale pink brick building of 1949 in an inoffensive Neo-Georgian style, visitor pass the porters, rows of pigeon holes and a picture gallery of senior members of the College. A slightly gloomy corridor with glimpses off into trim courtyards leads down to the Library, a modern refurbishment, but traditional in its air of quiet intellectual inquiry. The compact, comfortable archive reading room is tucked away in a suite of rooms at one end. 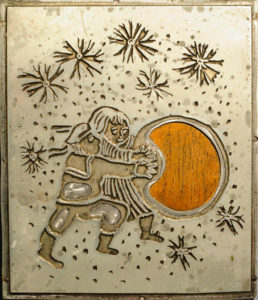 Metal engraving, probably for a Christmas card, by Edwin Smith. More experienced researchers than us may have rigorous strategies for tackling archives like this. We scan down the list to find something that looks promising; I go for ‘5 Edwin Smith: Personal papers….2 Sketchbooks/Artwork’ and take a chance on that. Alright, that is not entirely random, but I might have gone for ‘4 Exhibitions’, so there is an element of chance in what I will find. Anne Thompson, the ever cheerful and helpful Archivist, brings the boxes of files and books and I start sifting through the material. I make notes: Sketch Book 1 commenced Sept 1939 – [‘44]: mainly pen and ink; some pencil & some crayon colouring; cats & figures, ‘cat women’, fantasies, architecture, trees, VIII 41 portrait of a woman – Rosemary?, February 41 – cats & figures, woman and baby – baby in chair, baby studies – Edwin’s son Martin?, musicians, bombed buildings – blitz, London, café, child, Sept 44 beach scenes. A cardboard camera, sent to Edwin Smith by Thames and Hudson staff. 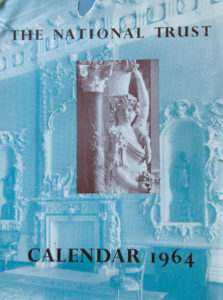 Another day I find Edwin’s itinerary for photographing The Great Houses of Europe (1961); coming home he pays 22,000 lira in excess baggage at Rome. 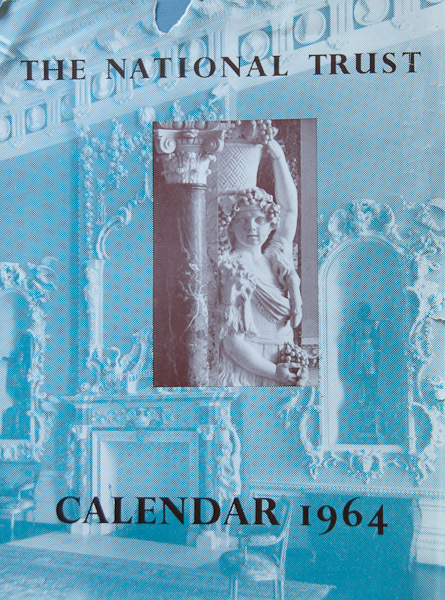 On another, evidence of a previously unrecorded publication of Edwin’s photographs in Furor Hortensis: Essays on the History of the English Landscape Garden in Memory of H F Clark (1974). 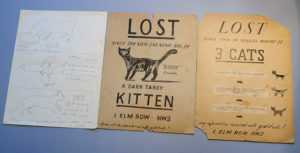 We find proof prints of etchings, details of reproduction fees, instructions on how to feed the cat, previously unknown figure photographs of Edwin, a paper fold out camera signed by people at Thames and Hudson, and Edwin’s opinion that in 1970 he was worth £100 a week as a photographer. It’s a treasure hunt, a delightful exercise in serendipity. Yet over time connections and patterns emerge and very slowly the fuller picture of Edwin: 22,000 lira in excess baggage confirms that he did not leave things to chance and travelled fully and professionally equipped to capture great houses spread across Europe. There is a description and listing of the archive available for Download in PDF form, provided by Newnham College.